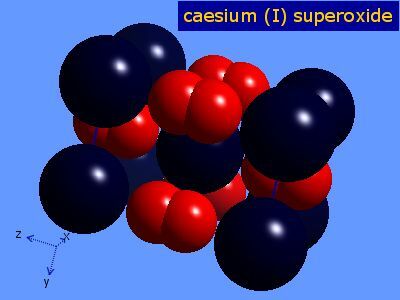 The oxidation number of caesium in caesium superoxide is 1. If caesium is burned in air, the result is mainly formation of orange caesium superoxide, CsO2. The table shows element percentages for CsO2 (caesium superoxide). The chart below shows the calculated isotope pattern for the formula CsO2 with the most intense ion set to 100%.